Stimulating your baby. Another hot topic causing endless confusion and doubt for so many parents. What should we do? Are we doing enough? How can we ensure our baby achieves every milestone on time? In a world of information (and stimulation) overload it’s overwhelming figuring out the best way to spend precious time with your little one. 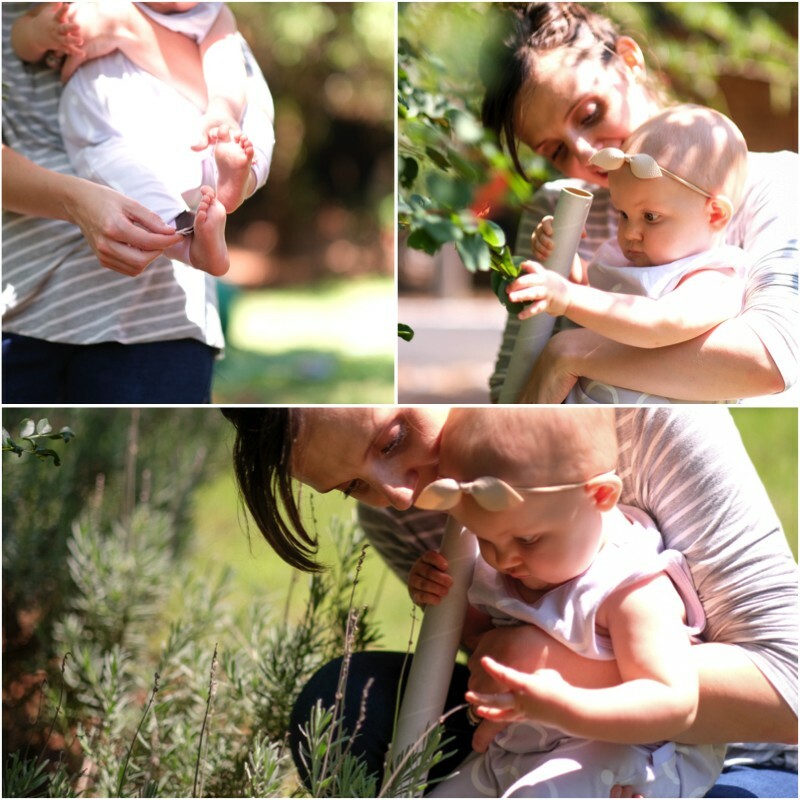 Over the years we’ve learnt to a few principles that work for us and will hopefully benefit you and your baby too. Shaped by what I studied during my Early Childhood Development degree, experience as a mom as well as tips and advice we’ve stumbled upon. Forget about “stimulation” for the first few weeks. Your love is all baby needs to optimise development. For a newborn baby every moment in this new world is filled with constant stimulation. From the natural light they now find themselves in, to the feel of clothing on their skin, the sounds and smells outside the womb and even your loving touch. The first few weeks should rather be aimed at minimizing stimulation, establishing a safe space for your little one and securing a trusting bond with mom and dad. YOU are really all your baby needs. Smile, cuddle and talk to your baby. Enjoy tummy time on your chest, hold and carry your baby often. Improved muscle tone and development while increasing blood circulation. Increased endorphin production which assists in calming your baby. It awakens all of your baby’s senses. Stimulation of the central nerve system and entire brain. Development of emerging communication skills. Increased attachment and bonding between mom and babe. Contact the International Association of Infant Massage. Our instructor came to our home over the course of 6 weeks teaching us all we needed to know. Regulating and stabilizing body temperature outside the womb. Relieving pain, stabilizing blood sugar levels, transferring good bacteria and improving heart and lung function. All of the above aids in calming baby and making it possible for him / her to be open and receptive of the world around them. Processing all the input received successfully. Stimulates touch and bodily awareness. Babies get to interact socially with parents on eye-level instead of only being looked down upon. Babies experience their world from a different view. The movement experienced causes vestibular (inner ear) stimulation which leads to the development of balance and future motor skills. It encourages good mental and emotional development which is the foundation of all learning. 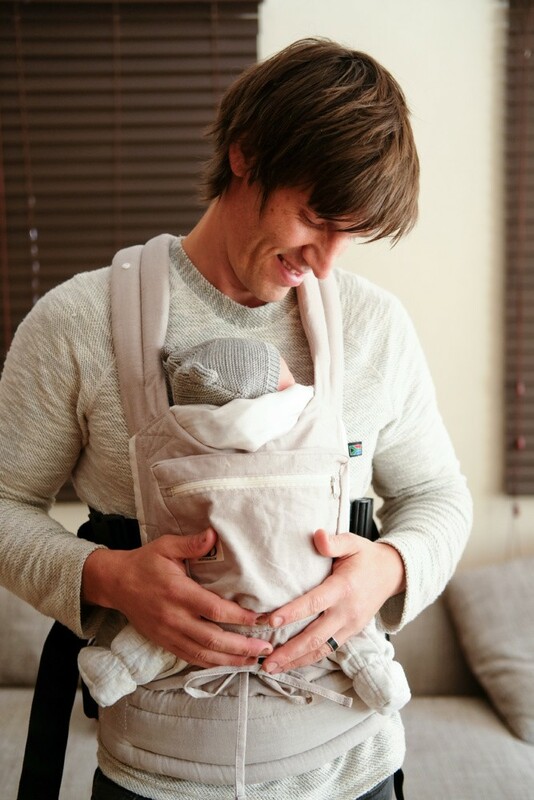 These days there are no shortage of baby carriers so be sure to choose one best suited for your needs, that can be worn comfortably. Our favourite is the Ubuntu Baba Stage 1. We have used ours since Ava was only 6 days old and will definitely go over to a stage 2 soon. Read more about why we love ours here. Strengthening of the neck, back and shoulder muscles which in turn leads to better trunk, shoulder and hip control. It lays the foundation for all future movement. Motivates exploration and brain development. So, it’s undeniable. TT is important and can be started from the day you take baby home. In fact, starting early and making it part of the routine is key to getting baby use to this strenuous exercise. Crying and fussing is normal reaction for baby but below are a few tips on how you can establish good TT with baby. TT doesn’t need to only be on the floor. Start with baby on your chest, lap and then the floor. Start off with short 3-5 minute sessions. Later increasing the duration. At around 3 months old baby should be able to do 60 minutes of TT in a day. (Not all at once off course). Provide support if needed by propping a rolled up towel underneath baby’s arms. Distract baby by talking to them or showing them a high contrast, attention grabbing toy. Do it together! 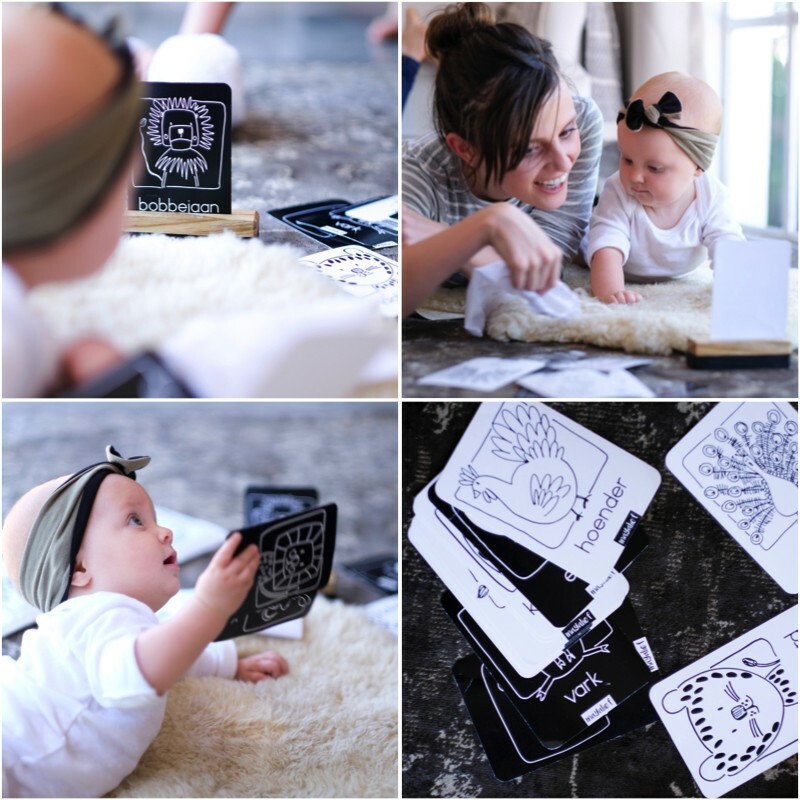 Lay on the floor with baby showing him / her flashcards, photos or looking in a mirror. Make TT part of the routine. Always doing a quick session after a diaper change (never on a full stomach, after a feeding though). Baby should be comfortable and alert before TT. Don’t give up. As baby becomes stronger, TT will become easier. Midline crossing is another important skill for baby to acquire and refers to baby’s ability to coordinate both sides of his / her body, getting the left to work with the right and crossing the “imaginary line” dividing our bodies in a right side and a lift side. (It also includes the top and the bottom half as well as the front and the back). It shows that both sides of the brain is communicating with one another successfully. All fine and gross motor skills are reliant on successful midline crossing. Roll baby from side to side during nappy changes. Cross baby’s arm and legs. Let your baby touch their hands and feet. Left hand to left foot, right hand to right foot, cross-over, left hand to right foot, right hand to left foot. Take baby’s knees to their tummy and back down again. Place objects in both of baby’s hands. Pass an object from one hand to the other. Clap hands and bang small blocks against one another. As baby settles into life in the outside world, they will become more alert and curious. Ready to learn about everything around them but only for very short instances. 10-15 Minutes will be all you have during the 1st few months. Be sure to make it count. It was around this time that Ava started noticing the high contrast black an white Little Me dangles we hung above the changing station. They had been hanging over her head since birth stimulating her nerve cells to multiply and form connections, developing the visual part of her brain. These work so well and are aimed at soothing baby while increasing concentration. 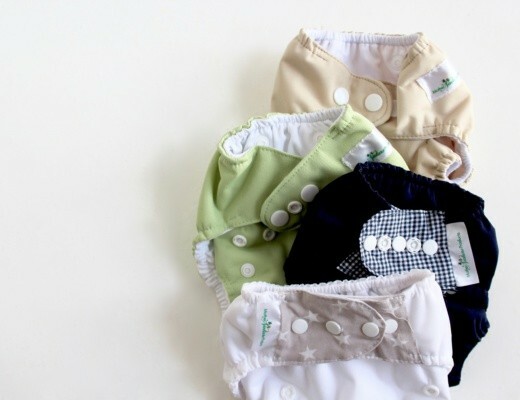 With over 30 + cute designs to choose from you can have an entire collection to keep baby entertained during nappy changes. I regularly switch out designs and colours and Ava really enjoys interacting with them. At 1st she only tracked them with her eyes, then she started waving and trying to grab them. Now she intently touches and holds them investigating every detail. We talk about each one and have even named a few. Spending time in front of a mirror provides many play opportunities seeing as babies love looking at and investigating faces and emotions. Providing baby with an unbreakable baby mirror is an option, we however prefer including a full size mirror securely fastened to the wall, on baby’s level, in the nursery. We did this with all 3 our girls and at 6 years old, we still find Eliana playfully looking at herself, kissing the surface, naming body parts and teaching her baby sisters about their amazing bodies. Remember to talk to your baby A LOT! The more word they hear the better. Don’t feel silly because baby can’t respond with words. pay attention to non-verbal queues, smiles and babbling. Repeat the sounds baby is making. Blow bubbles to one another, coo and giggle together. Communication includes listening as well so be sure to take turns while “talking”. Also expose baby to different sounds, music and voices. Describe what you are doing, things around the home. Sing to baby, repeat rhymes and read. It’s never too early to start reading and with so many options of story and picture books available you’re sure to find one baby can enjoy. Interactive books where baby touches, lifts and looks for different items keeps Ava’s attention but she also enjoys fabric books that can be “tasted” and scrunched between her hands. Touch and other tactile stimuli teaches your baby about their own body. Expose your little one to a variety of fabrics by placing them on different types of blankets and surfaces while explaining the different sensations they might be feeling eg. soft and warm vs. cold and hard. Physically play with your baby – they won’t break – just ask dad. A bit of gentle wrestling (even if she’s a girl) does wonders for baby and don’t forget bouncing on mommy’s lap, flying like an airplane way up high or swooping down low. Encouraging all those “big milestones”. We really shouldn’t but with everyone always asking… How can we not compare and grade ourselves and our babies with regards to the “normal rate and trends of development”. Especially motor development such as rolling, holding, sitting, crawling and standing. I won’t be getting into detail regarding milestones. After 3 babies, I know kids develop at their own pace. We just need to facilitate the opportunities for stimulation, the rest will depend on baby. Tummy time encourages rolling and crawling but you can also assist by providing a little motivation. Frustration is your friend. Place a toy to the sides of your baby or just out of reach, encouraging them to “go for it”. Practice rolling from side to side so that baby feels familiar with this sensation. Also roll baby rather than lifting their bum when changing diapers. Around 4 months a change of perspective is fun and baby will enjoy sitting supported, observing the world and you from a new point of view. We always go for an apple box (easily available from your local green grocer). It’s a modest choice but you’ll be surprised how great this works. 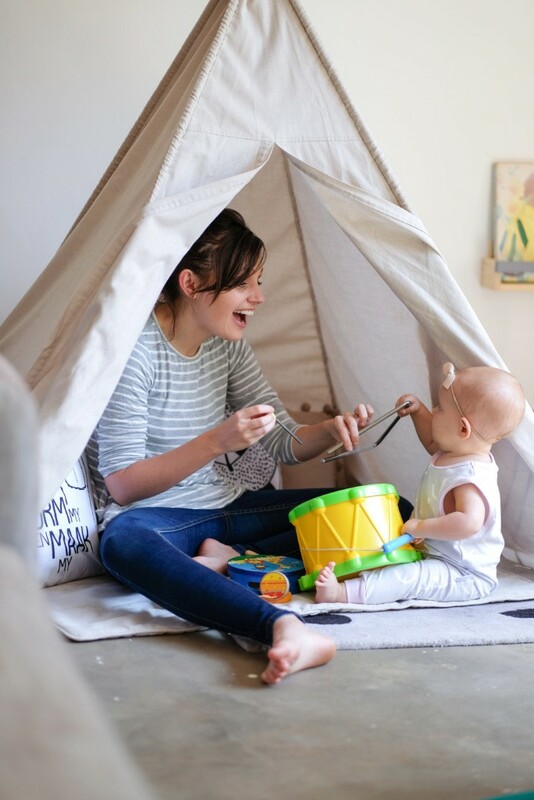 Add a small cushion or a few blankets to support baby and presto, an effective baby seat. As baby becomes stronger simply removes the blankets and pillows until baby sits independently. The girls all loved being pushed around in their apple boxes and I would add a rattle, mobile or clip-on dangle for some independent play while preparing dinner or tidying up. 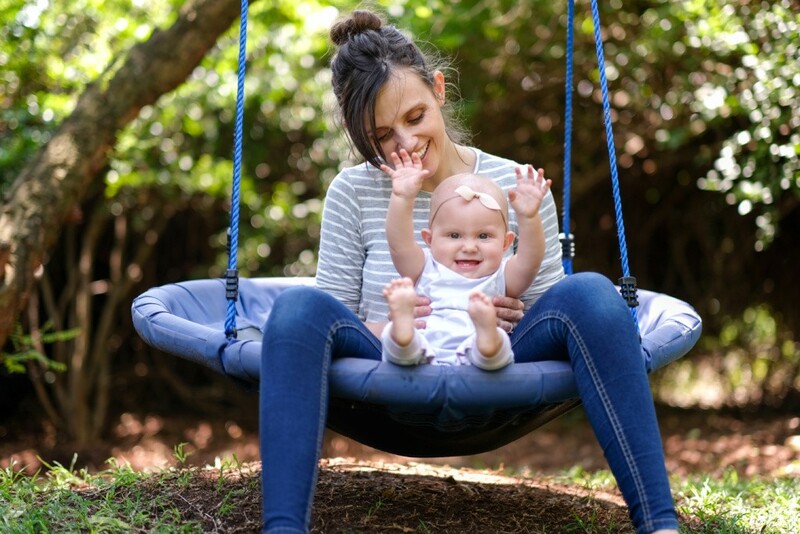 Lia, our middle little was tactile sensitive after birth and it was with the help of gentle swinging exercises (and a wonderful occupational therapist) that we helped her adjust and accept different touch sensations. Swinging also teaches sensory integration – the body’s ability to organise the information received via touch, movement, body awareness, sight, sound, and the pull of gravity and use it to participate in everyday activities. At 1st we gently swing our babies in a reclining position back and forth, from side to side. Later swinging can become more fun. We bought Eliana a backyard swing for her 1st birthday and last Christmas we added a circle swing too. All the girls love swinging and being placed in a blanket and swung from side to side. Although a lot of parents prefer skipping on messy play or waiting for school to assist most babies enjoy messy play from a young age. With proper adult supervision and a little planning this is one of best ways to develop your little one’s brain. The benefits and ideas are too many to mention here. I’ll be doing a separate post on this next month so be sure to subscribe to our newsletter and make sure you don’t miss out. Water play is definitely easier during summer but remember bath time holds tons of learning opportunities too and it just so happens to be our next momming 101 topic. Look out for a future post on water play coming this spring. You are baby’s favourite toy and nothing beats meaningful one-on-one interaction with mom but we all need a break and toys do add value, especially when used mindfully. 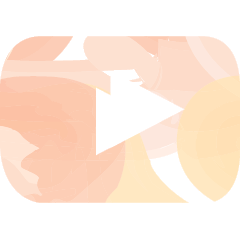 White noise or soothing sound makers. Dangles and mobile above the changing station. Brightly coloured toys to look at. Soft books and picture books. Noisey toys that baby can easily hold. Toys that appear and disappear like a Jack in the box. Wooden, fabric and plastic stacking blocks and cups. Balls in all sizes and textures. Anything noisey and interactive showing cause and effect. The kitchen cupboard – babies love unpacking and packing away pots, pans and plastic dishes. Interactive hardcover books with bright, bold pictures and simple stories to follow. I can’t help but feel nostalgic when mentioning Fisher Price. I still remember my little pull-a-long phone and shape shorter passed down from sibling to sibling. Bright and colourful toys, boldly designed to attract baby’s attention, stimulate their senses and provide hours of fun! These guys are the experts and still create fantastic toys year after year to the highest quality and safety standards. Ava’s current bestie is her Foxy animal links soft toy. 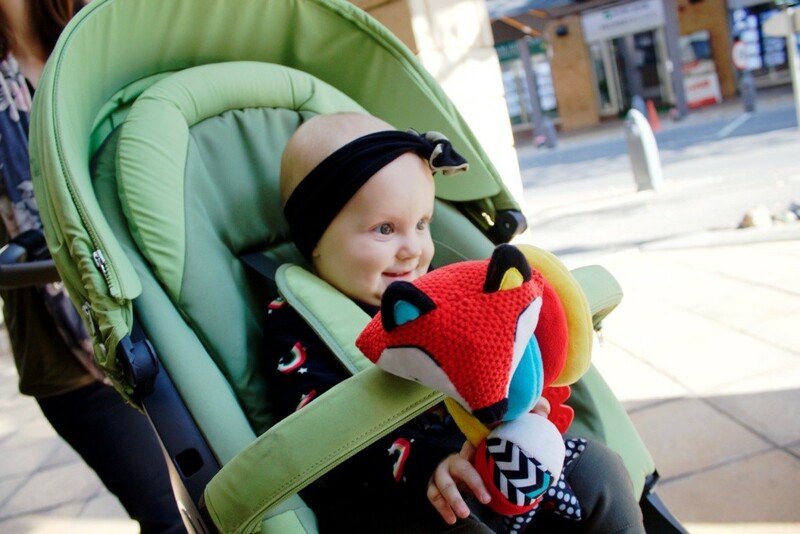 It curls easily over the front of her stroller or side of the playpen providing a cute friend to cuddle, a variety of colourful, textured fabrics and elements, to stimulate her senses as well as a crinkly paper inside to explore and a teether to help with itchy gums. No one does high contrast dangles and eye targets better. Ava is still obsessed with her dangles and enjoys starting at the cot pads we placed in her playpen and car seat. Another must-have item we have found very useful is beautiful play mats. We’ve been using ours since birth for tummy time and baby gym sessions. This is our top pick when it comes to play gyms. I love the classic, simplistic design and how easily it folds up. Add a medicinal sheepskin and your baby is ready for hours of tummy time, eye tracking, back lying, object swotting and more. 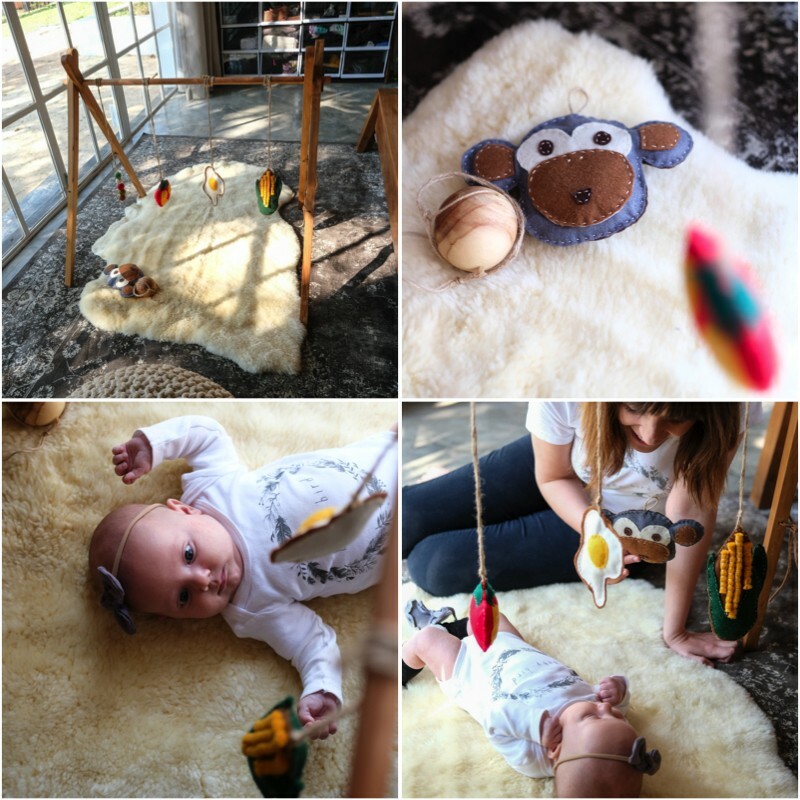 I use this play gym to suspend a variety of dangles and objects for Ava to enjoy. I also have an adorable set of Krôkenoster felt toys that Ava loves to touch and explore. 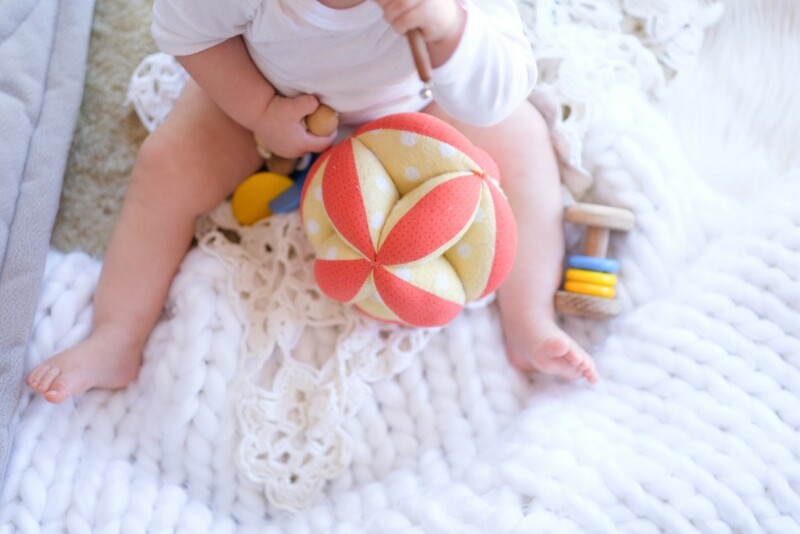 Babies enjoy soft toys and La Fédé makes the best! Chantelle uses a variety of fabrics, colours and textures in all of her designs even adding a bell or other noise makers. Ava has an entire collection of bears in every shape, size, texture and colour. Use them for tracking, handling, hugging, playing peek-a-boo… Just don’t forget about them on the shelf. Perfect for independent play. My Montessori Home helps parents set up the right environment at home encouraging children to develop concentration and a sense of autonomy. All the toys are made with natural, safe materials right here in South Africa and respect the Montessori principals. Ava still enjoys playing with all the pieces in her infant rattle kit as well as her cotton puzzle ball. I can’t wait to purchase some more items soon. You may only know her as a teething aid but Sophie la Giraffe is more than just a teething giraffe. 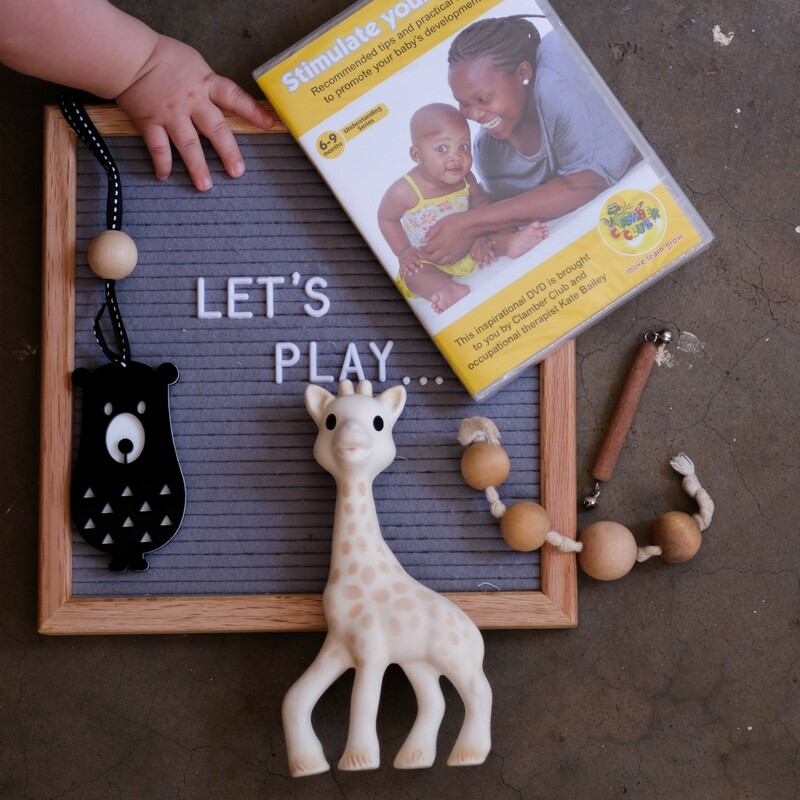 Sophie has an extensive range of wonderful toys aimed at stimulating baby’s sight, motor skills, problems solving abilities and all other areas of development. They get bonus points for using 100% natural rubbers in a lot of their toys making them eco-friendly too. You’ll have to wait till Friday for our full review on this brand. I’m keeping it a surprise in honour of Sophie’s 57th birthday. Focused on minimalist, monochromatic design Mayalief’s educational toys are perfect for baby (and very affordable too). We use her first word flashcards often and Ava can look at her animal soft book for what seems like hours. We talk about what we are seeing, enjoying time together. When toys are pretty enough to be displayed… Even if you don’t have kids. Tiger Lily has the prettiest collection of wooden toys aimed at stimulating and educating babies and toddlers. 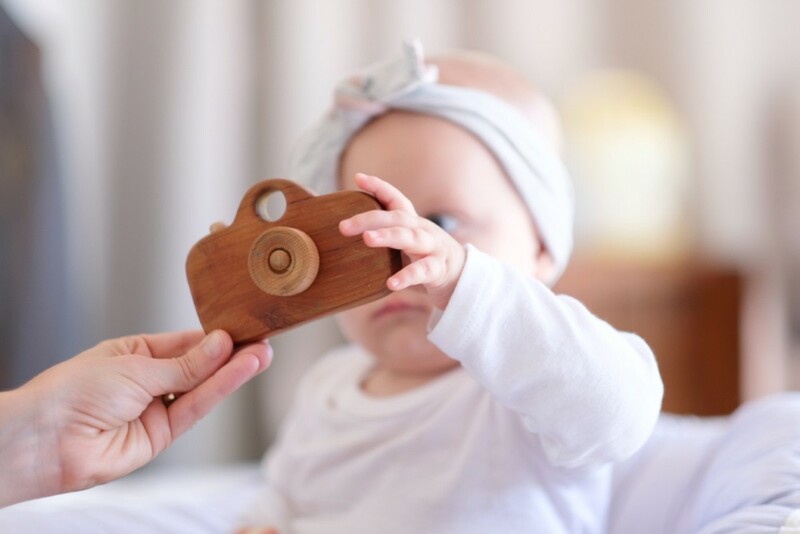 Ava’s personalised hand rattle is a keepsake we’ll treasure forever and she loves touching and playing with the wooden garland (actually meant as decor). She’s also grown very attached to her Sleepy Ellie and all the girls can spend hours sorting nesting dolls. Simply play, loaded with learning, at it’s best! 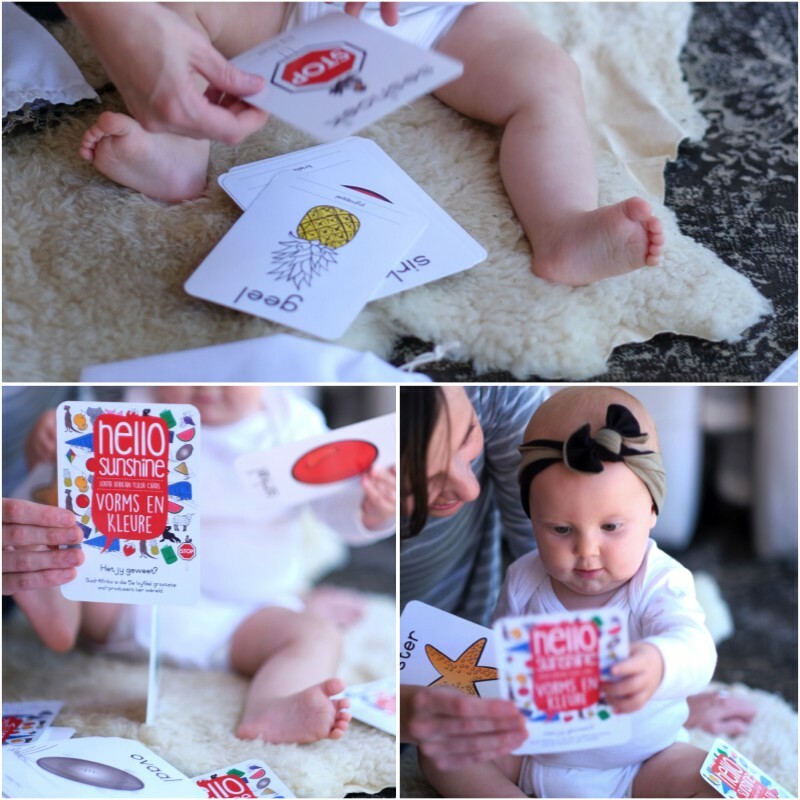 Exciting, colourful, South African themed flash cards to grab baby’s attention. Perfect for exercising eye muscles and vision. We use these during tummy time, as a distraction when traveling gets too long or just for “reading” and building vocabulary. 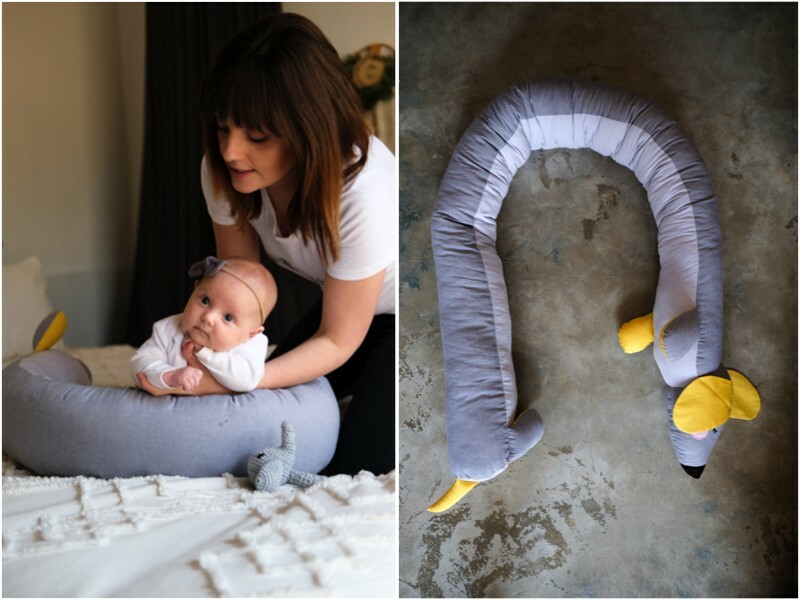 So this may not be a toy brand but our Nordic Nuss sleep pod and Buddy Long dog has been so handy during tummy time and fun mommy and me play. I had to mention them. It even provided Ava with extra support while learning to sit. Buddy is also fun to use as baby starts crawling, providing an extra challenge to conquer as your little one climbs over and on top of him. Sturdy, wooden toys to play with and enjoy. Houtkappers has taken handmade, wooden toys to the next level with their stunning contemporary design. These toys are made to play with. Each item functional and attractive. 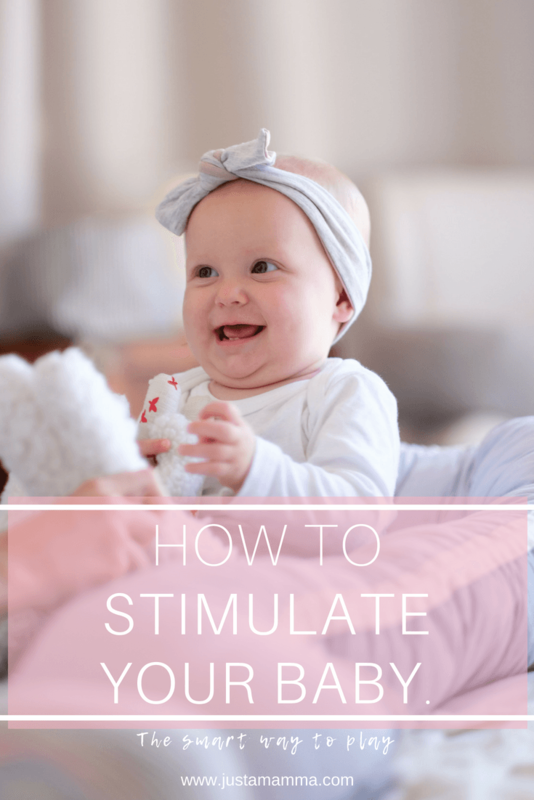 The feel, smell and taste provides baby with loads of stimulation. These toys will last and be passed down for the next generation to enjoy. It’s so easy to keep baby locked up inside. Cozy and warm, but there’s an entire world of fantastic natural sensory opportunities waiting outside. Don’t be scared to go for a walk in the neighbourhood or a stroll in the garden. 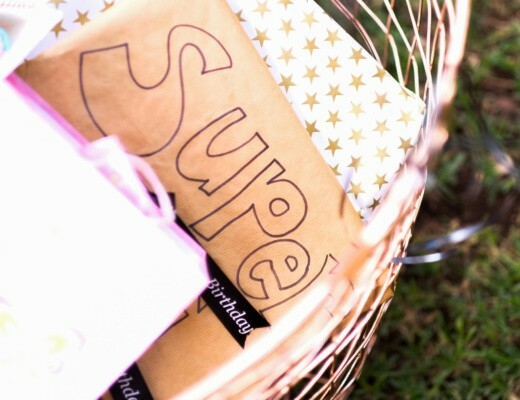 At first the feeling of sunshine, fresh air with the sounds and smells will be enough to keep baby occupied. Later make an effort to show baby a thing or two. Have them touch, look and taste (if safe) the world beyond home. Flowers, grass, a stone or leaf… All the extraordinary things we take for granted. Remember, this is baby’s 1st encounter so give him / her the time and opportunity to enjoy this moment. Outdoor play will always be beneficial to kids. 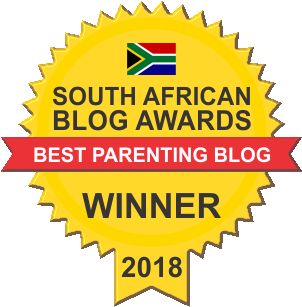 A note on play pens and independent play. Kids do not need to be entertained every second of the day. Independent play is also very important and it is when you leave your child be that they start developing other important skills such as creativity, imagination and independence. It also teaches your little one to be calm and focused. Leaving baby alone to play can be tricky and even dangerous at times, especially with siblings and in a home with steps. We find using a playpen handy. 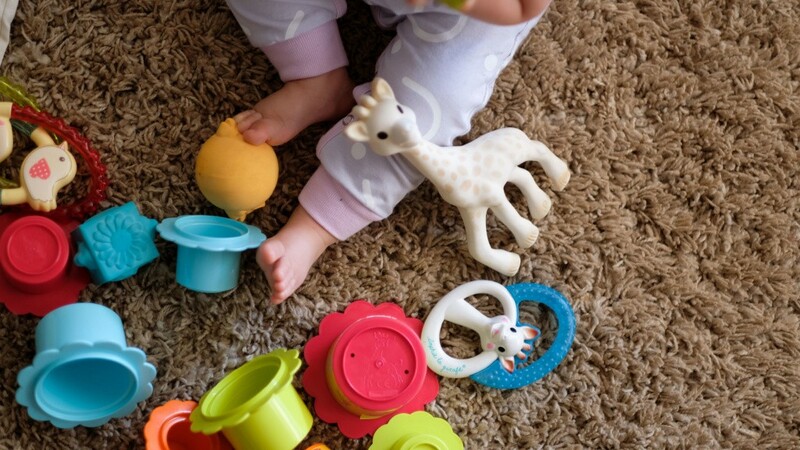 Filled with safe, age-appropriate toys for baby to explore. Ava can enjoy some “alone time” free to do as she pleases without a sibling or parent bothering her. We also have a baby gate at her bedroom door. Her room is her safe haven and she loves crawling around by herself, unpacking toy baskets and playing with whatever she likes. Make sure baby is dressed comfortably. Barefoot is best when playing. Understand age limitations and don’t expect more that what your little one is capable of. Don’t rush baby and remember, repetition is the key to learning. Don’t overstimulate your baby. Most of what I have mentioned above isn’t anything new. parents have been doing it for years. Play is one of the parenting instincts that actually does come naturally – we all use to be experts at it. The secret is to trust your natural instincts and not overthink it. If you remember to focus on creating experiences that call to action the use of your baby’s senses; touch, smell, hearing, taste, sight and movement, your baby will be fine. Even better than fine. He / she will be happy and well developed at their own pace. Clamber Club knows how difficult it can be getting out of the house with a little babe, especially during winter. Together, we are giving away a set of their Stimulate your Baby DVD series. 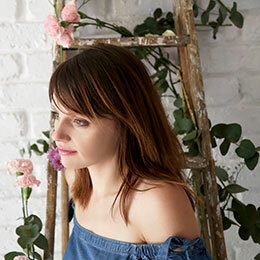 Let leading occupational therapist Kate Bailey show you easy and fun ways to stimulate your baby with everyday activities using what you have at home. Aimed at developing baby’s sight, touch, listening skills, fine and gross motor abilities and more. These DVDs are amazing! They make so much sense encouraging a parent’s intuition. Making stimulating your baby a natural, enjoyable experience instead of a stressful, exhausting chore. I LOVED each one of the 3 DVDs included in the set (ages newborn -3 months, 3-6 months and 6-9 months). It’s the perfect way to learn more about how you can play a positive role in your baby’s development and how to bond with your little from day one. This made everything much easier to understand. Parents can feel confident in knowing that what they do is serving a meaningful purpose. Another highlight was all the DIY play and handmade toy ideas shown. These DVDs will answer all your questions regarding baby stimulation and keep you playing with your child for years to come. Please leave a comment below sharing a favourite game to play or baby toy that your little one loves. You can also enter via Facebook too, just find the Let’s Play post on our page. (It will be posted tomorrow morning). Competition closes on the 31st of May 2018. The winner will be picked at random and announced on the 3rd of June 2018. The greatest care will be taken when mailing your prize but Just a Mamma and Clamber Club do not accept any responsibility for lost, stolen or damaged goods. Special thanks to Clamber Club for giving me a refresher course in all the things I studied all those years ago. Other useful (but very academic references that came in handy – not recommended for moms). Beginnings and Beyond: Foundations in Early Childhood Education by Gordon & Browne. The Creative Curriculum for Infants and Toddlers. Dombro, Colker & Dodge. Love die post! Dankie!! 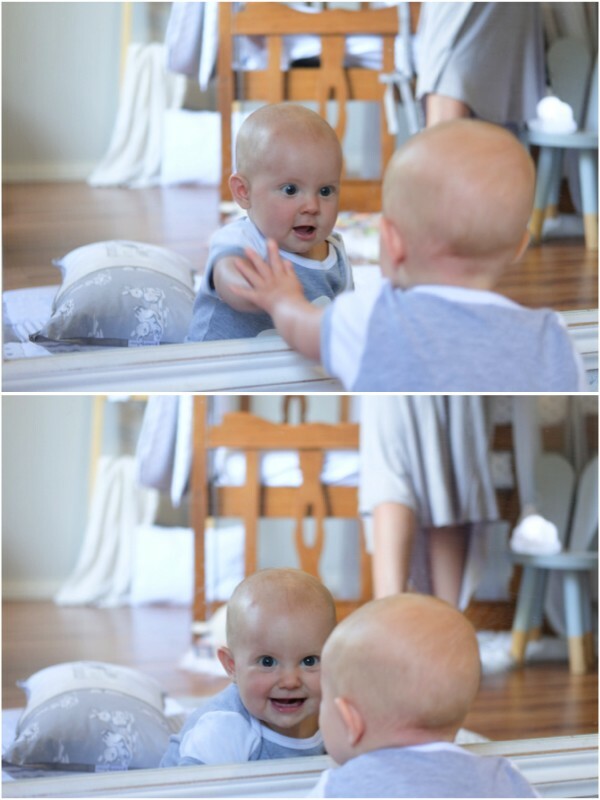 Ek speel baie peek-a-boo met Zion. En steek sy speelgoed weg en haal dit weer uit . Hy het die afgelope tyd bietjie separation anxiety. Uitstekende post! Ongelukkig is ek nog nie self ‘n mamma nie, maar my liefste skoonsus verwag ons familie se eerste kleinkind!!! Yeah! Sy is ‘n ystervrou wat wat die wonderlikste bokkaas maak en ‘n pragtige deli het in die Oos-Vrystaat. Hierdie is die ideale geskenk vir ‘n “mommy-to-be” wat nie naby ‘n clamber club is nie om haar klein plaasmuis te stimuleer! This is such a great post! Thank you for sharing. My little one love to play Peek-a-boo and “where’s Noah”. He also loves looking at picture books and touch and feel books, as well as feeling things with different textures. Love, love, love this post – thanks for sharing!! Thank you for this very thorough post! There are so many ideas out there, but it is important to get back to the basics, the important stuff! Eran loves any type of ball at this stage! I have also found a great company “Nubabi” that sends you weekly emails with suggestions for age appropriate play in those 5 categories. Lovely to get new ideas without being overwhelmed! Dankie vir al die amazing info..my dogtertjie was al 5 keer in 10 maande in die hospitaal!! So ons het baie speel om in te haal😆 sy love peek a boo en storie tyd..
Love die post!! !dankie vir al die raad..my dogtertjie is 10 maande en was al 5 keer in die hospitaal..ons het baie speel om in te haal.sy love peek a boo en storie tyd!! My babygirl is 4 months old told. She loves her Sophie Giraffe & her Snuggle Bunny thst she sleeps with all the time. We enjoy playing Peek-a-boo with her bunny and thoroughly enjoys looking in her mirror. My little man is 5 months old and loves tickles and giggles and when me and his 3 year old sister sings …. handjies klap … and claps his hands for him. He adores his sister, she reads him stories and makes jokes to make him laugh. Luca loves the pram string from Gnash Kids that I tied to his cot. It’s great to see him develop his hand eye coordination as he tries to grab it. He also got a very nice cheap rattle from a friend – it’s the only toy that has a thin enough handle for his little 11-week old hands to hold. It just shows that toys don’t have to be expensive to be stimulating. Thank you Bleka and good luck. Blogging isn’t easy but it feeds my soul and hopefully what I post helps, inspires or just makes a mama feel empowered in some way. x Let me know when your site is up and running.